Low sleep apnea oxygen level is a sign that your treatment for sleep apnea is not effective. Patients with breathing problems during sleep (sleep apnea, COPD) often have low oxygen levels in their blood. Keep in mind that anything below 90% oxygen level is dangerous to your body and require intervention. Another thing to consider is that the brain can only survive 4 minutes once oxygen is completely cut off. How to treat sleep apnea oxygen level. In sleep, the upper airway muscle tone of the patients with sleep apnea tends to narrow and collapses temporarily. When this happens, the breathing stops accompanied by a drop in blood oxygen levels and arousal from sleep. The low oxygen levels during sleep can make you feel very tired in the morning and will contribute to more restless sleep. Furthermore, when the oxygen levels start to drop, the carbon dioxide levels build up in your blood. This can lead to morning headaches, fatigue and sleepiness during the day. Even the most recent studies (2012) demonstrates the link between sleep apnea and oxygen desaturation. That's why the oximeter is an important tool in clinical assessment. With a finger pulse oximeter you can monitor yourself to see how effective is CPAP (you'll learn how to do this bellow). The device can also be used to diagnose sleep apnea, but only if you use a quality product. For more information on how to use an oximeter to diagnose sleep apnea, read the portable pulse oximeter article. How Does Sleep Apnea Oxygen Level Affect the Body? Any value of blood oxygen level bellow 92% is abnormal. However, the number of desaturations and the time spent with abnormal oxygen levels is important. For example, if you only desaturated below 92% once or twice during a 7 hour sleep, and the desaturation level lasted only a couple of seconds, it's not a reason for worry. The right side of the heart has the role of pumping blood through the lungs, which requires a much lower pressure. A higher pressure can lead to severe fluid buildup in the body that can cause life-threatening shortness of breath, heart failure and even death. Please call your doctor urgently if you experience chest pain or shortness of breath that is not relieved by rest. If your doctor discovers that your blood oxygen level (oxygen saturation) is less than about 90% during the day (when you are resting), then your oxygen levels are probably dropping during the night. This means that you have sleep apnea, or other respiratory disorders, like UARS. Your doctor may recommend overnight monitoring of your oxygen levels using am oximeter. 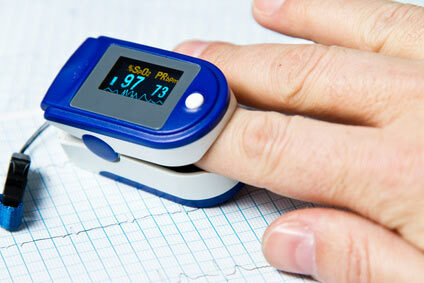 In a sleep study, you usually have the oximeter attached on the finger. You can use a portable oxygen saturation monitor or oximeter, a cool little device that can record your sleep apnea oxygen level and pulse rate during sleep. A medical approved oximeter is truly a great tool to see how well CPAP is working for you. A tip before buying an oximeter: you would do well to invest in a recording oximeter with software. You can upload your data in a computer, and you can go to your sleep specialist with the results. For more info about sleep study for sleep apnea, see sleep studies. So, if you have a low blood oxygen level, follow up with the sleep study as soon as possible. Continued drops in O2 levels will cause damage to cognitive function, short term memory, stroke and heart attack in your sleep, and a host of other problems. Overweight women who are pregnant or women who gain too much weight during pregnancy are at a higher risk of developing sleep apnea. This can cause a drop in blodd oxygen levels during sleep which can create complications for the baby. So if you are overweight or gained a lot of weight during pregnancy, speak with your doctor to investigate if you have sleep apnea. For more info about obesity, see sleep apnea and obesity. Patients with sleep apnea are usually treated with CPAP machines. If apnea episodes disappear, the oxygen levels will improve to normal levels. How often should you use the CPAP? If your doctor prescribed CPAP therapy, you should NEVER go a night EVER without a CPAP on or even take a nap without one. If your oxygen saturations drop significantly and persist during the night, you may benefit from overnight oxygen delivered by nasal masks or nasal prongs. You can have low oxygen levels during sleep even if you use the CPAP. This means that your CPAP doesn't have the desired effect. That's why is important to monitor your oxygen and pulse rate. To keep a better eye on your sleep apnea oxygen level you might consider purchasing a finger pulse oximeter. Remember: don't use inferior equipment to measure your well-being and don't change anything without checking that information with a second opinion or proper equipment.